“If you brought a caterpillar to a biologist to analyze its DNA he would tell you by all accounts it is a butterfly. He looks nothing like a butterfly but has the DNA inside him. No amount of yelling at him will make him change. He will turn into a butterfly eventually and will display the behaviors and actions of a butterfly. He will mature into what is true about him.” John Lynch in TrueFace. The same is true of a born again believer. They have the DNA of righteousness. They are holy. They need to thus live out of their new identity by the grace of God and the power of the Holy Spirit. I think this also illustrates well the main theme in the book of Titus: Gospel Fueled Godliness. Evidently Paul has left Titus with a big task involving three main things: 1) to appoint elders to lead the Cretan churches 2) silence and dispel false teachers and 3) to motivate Cretan believers to be “zealous for and intent on engaging in good works” (2:14; 3:8). This is no small thing since the people are known to be “idle and corrupt” (1:12). In contrast, this makes the average college freshmen look pretty good. And I thought my job was hard! Underneath Paul setting a high moral bar for elders, calling out false teachers as hypocrites, and showing the christians how to act is a beautiful gospel message. 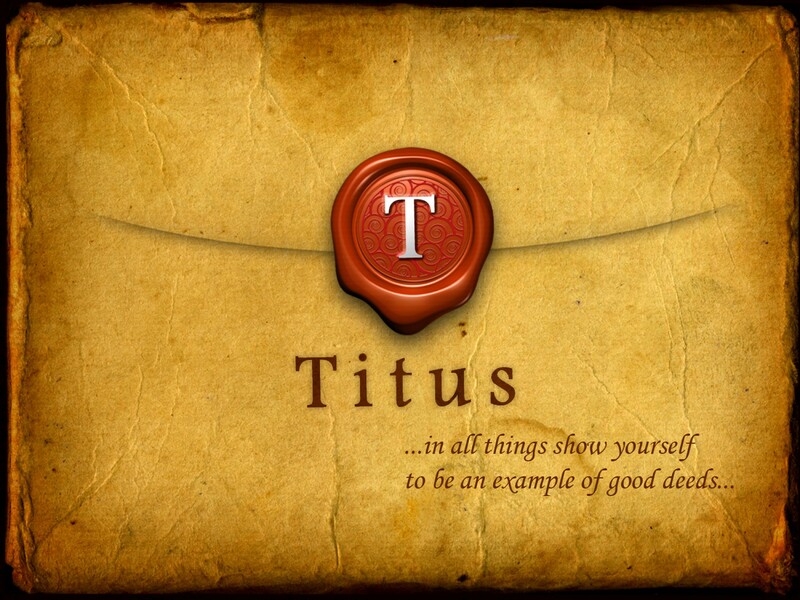 Two different times Paul goes to it (2:11-5; 3:3-7) as a way of motivating Titus’s audience. Both times something appears onto the scene that changes the game, nothing is the same afterwards. The first time it is the grace of God and the second time it is the kindness and mercy of our Lord and Savior. It brings about training to live differently and a new identity as a child/heir of God with the hope of eternal life. And this happens only through faith, belief and trust in Jesus as our Savior…the giver of true righteousness. Paul lives for this message and he wants Titus and the Cretan’s to as well. Because this is God’s message and he is on a mission. He sent his Son for a reason that doesn’t stop at people just believing in him. He wants to set us free, purify us, and send us out as transformed agents ready to do good (2:14). This can’t happen apart from faith in his justifying grace. And when his grace comes on you, these good works WILL follow. And when they do, it is a model for believers to look up to and it shows to the world how amazing and beautiful God’s grace truly is. It takes evil, corrupt, hateful, idolatrous, selfish, greedy, envious people and trains them to be self-controlled, self-less, others focused, serving, loving, merciful children of God. All due to the truth and power of the gospel of God’s grace. So you see, behavior is linked to belief. What you believe will effect how you live and nothing shows this more than faith in the radical grace of God that produces people eager to do good. i like the example of the caterpillar dna. from caterpillar to butterfly is just a matter of time.